Karina's Kreations: Christmas Lodge Beauty!!! I was trying to make a card with the Christmas Lodge stamp set that could be used for a winter Birthday or a Thank You card. What do you think? The Christmas Lodge stamp set comes in Wood Mount #123767 $41.95 or Clear Mount#123769 $31.95. 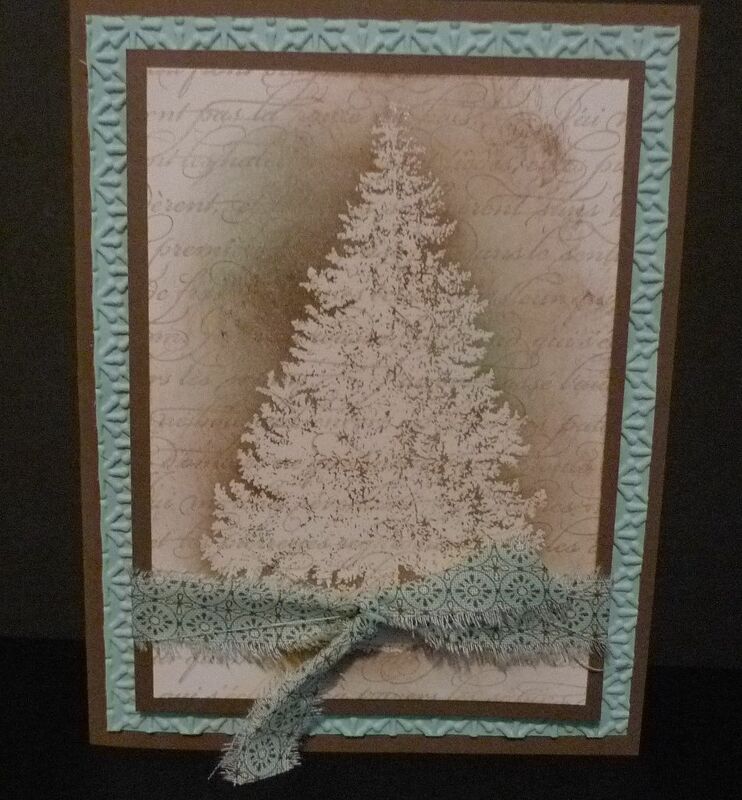 To make this card, start with 3-1/4" x 4-1/2" piece of Very Vanilla Card stock. Ink up the En Francais( #109521 $21.95) stamp set with Soft Suede ink and stamp once on scrap paper and then onto the Very Vanilla card stock. Stamping off once will give you a softer image. Stamp the tree image from Christmas Lodge in VersaMark ink on the Very Vanilla card stock. Sprinkle with Clear Stampin' Emboss Powder and heat with a Heat Tool. 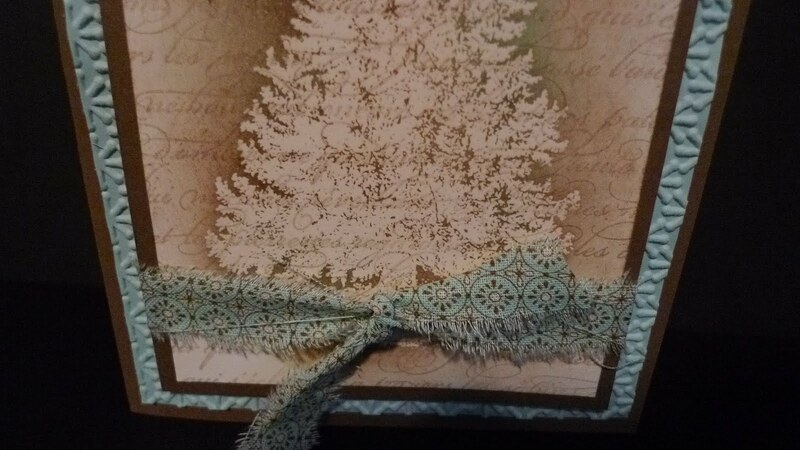 Sponge Soft Suede & Pool Party ink over and around the tree image. Wipe excess ink away with a tissue. Mat onto Soft Suede card stock. 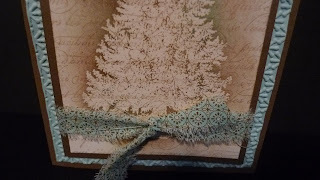 Tear a strip of Spice Cake Designer Fabric and tie around the tree image. Place 4" x 5-1/4" Pool Party card stock in the Snow Burst Textured Impressions Embossing Folder and run through the Big Shot die cut machine. Attached to Soft Suede 5-1/2" 8-1/2"card base. This is a really fun technique to try at home. It was demonstrated at the Stampin' Up Regional event by my friend Cara. I always love her ideas!! !